General Motors Co.'s European operations posted a wider loss in the third quarter compared to the previous quarter, blighting otherwise bright results ahead of the U.S. automaker's initial public offering next week. GM Europe's third-quarter loss was $559 million before interest and taxes, more than double the $160 million in the three months ended June 30. GM Europe lost $1.2 billion on an Ebit basis in three quarters this year. Helped by an accelerating turnaround in North America, GM posted third-quarter net income of $1.96 billion on revenues of $34.06 billion. In the third quarter of 2009, GM posted a $1.2 billion loss after going through a U.S.-funded overhaul in bankruptcy court. GM Chief Financial Officer Chris Liddell said the European loss largely stemmed from a normal industrywide reduction in volumes during the summer period. The launch of the new Opel/Vauxhall Meriva and an increase in Chevrolet sales in Europe, as well as favorable foreign exchange rates, had helped limit the loss, he said on a conference call with analysts and journalists on Wednesday. GM Europe unit sales were 391,000 in the third quarter ending Sept. 30, down from 409,000 the year before. Nine-month volume was 1.24 million, down from 1.3 million the year before. Opel/Vauxhall sales were 272,000 for the third quarter, down from 299,000 the year before. Nine-month volume was 881,000, down from 944,000. Chevrolet Europe's sales increased to 118,000 in the quarter from 103,000 the year before, helped by the introduction of the new Spark minicar. 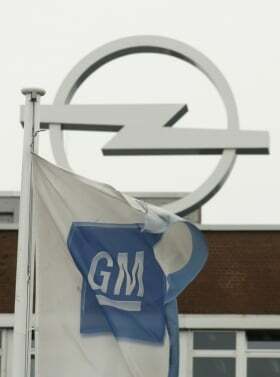 GM is restructuring its European operations, including cutting 8,500 jobs and closing a factory in Antwerp, Belgium. Opel/Vauxhall CEO Nick Reilly said restructuring costs were one reason for the third-quarter loss. In a letter to employees, Reilly said the restructuring is all the more urgent to enable the unit to reach its goal of breaking even next year and returning to profitability in 2012.